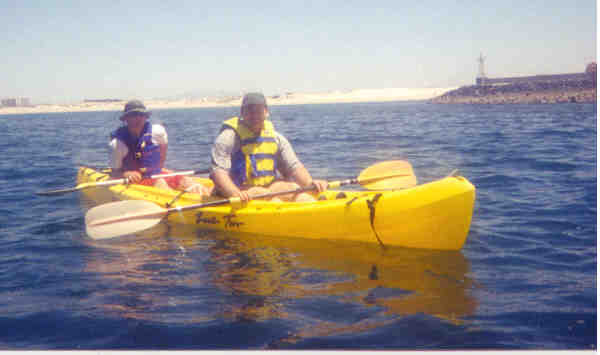 During a trip to Rocky Point my brother and I rented a two person Kayak and headed out of the docks in Rocky Point. We headed around the point with a friend who was in a one person Kayak. Near the point I saw a huge dark object move below the kayak. At first I thought it might be a dolphin, but it ended being a large sea lion. From there we headed down towards Los Conches. After getting to Los Conches we headed back to the dock. Kayaking is a great workout, and a great way to see a lot of scenery. Shane and I sea Kayaking.